In one week the first official teaser trailer for Iron Man 3 will kick off the hype machine for the first film in Phase Two of Marvel's cinematic universe. 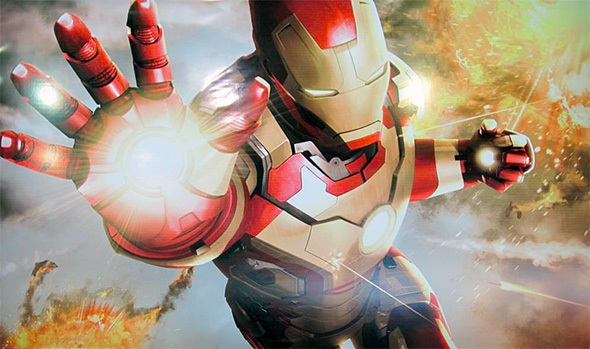 Until then, fans will have to settle for this cool promo banner showing Iron Man in action. Highlighting the Mark XLVII armor, Tony Stark is clearly dealing with some heavy fire power including guns and likely missiles. If you want a recap of what we saw at Comic-Con this past summer, check out our video blog right here. We're not sure how much of that footage will be shown in the first teaser trailer, but we'll be sure to post it as soon as it's available on October 23rd. Poster below! Iron Man 3 is directed by Shane Black (Kiss Kiss Bang Bang) working from a script that he co-wrote with Drew Pearce. Robert Downey Jr. Returns as Tony Stark and Iron Man in this sequel described as a technological crisis thriller in the midst of international war, taking place after the events of The Avengers. Sir Ben Kinglsey is playing Iron Man's arch nemesis Mandarin and Gwyneth Paltrow, Don Cheadle, Guy Pearce, Rebecca Hall, Dale Dickey, Ashley Hamilton, James Badge Dale and Jon Favreau all co-star in the Marvel Studios production which Disney will send to theaters on May 3rd, 2013. Getting excited yet? I had the same feeling as you, But I then saw some footage of him suiting up in the new armor and it looked awesome seeing it in motion! The comments at this site are really, really boring. Every comment section has a bunch of dudes saying "Cant wait!" or "I'll pass". Well your comment really brought some life and excitement to the place! You douchebag. Iron Man started Phase one and I am on board for Phase Two. Was not a big fan of Iron Man 2 & hope he just doesn't fight another big version of himself. Iron Patriot could be great but seen it already. Pretty awesome IMO. Can't wait for this....sorry Bobovision that I couldn't come up with better comment to keep you entertained. Any one else feel that there is too much gold/yellow on the MK47? Its funny how the promotional artwork's Mk. 47 suit looks WAAY better than the real thing. Here's hoping all that gold isn't too distracting when the teaser pops up soon..
No seriously, you guys in the comments here are a bunch of dullards. There's no point scrolling down to read the comments at this site. Not a scrap of creativity among ya. So why do you participate?Why don't you go and live your "exciting" life and leave the rest of us assholes without imagination to our own devices? You self aggrandizing prick. Thats what Im saying. Ive tried to make this place more interesting but its just not worth it. Another problem is the cowards like yourself who are too frightened to say what you just said using a registered name. Its sad. You think I am afraid of you? Just name the time and place buddy. Ok which city do you live in? SouthEastern Europe is not a city you moron. If they have dragons, that would be cool!